Wilson et al. (Wilson et al., 2006) proposed a model that drew upon the computational models and age-related neurobiological changes observed in animals to account for age-related memory decline. 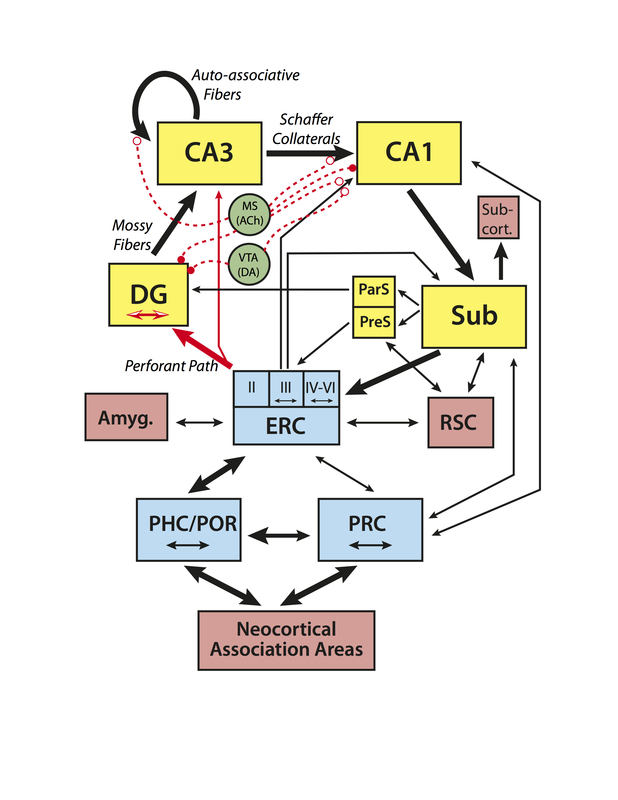 According to this model, alterations in each of the subregions of the hippocampus (shown in the figure below) contribute to age-related memory changes. 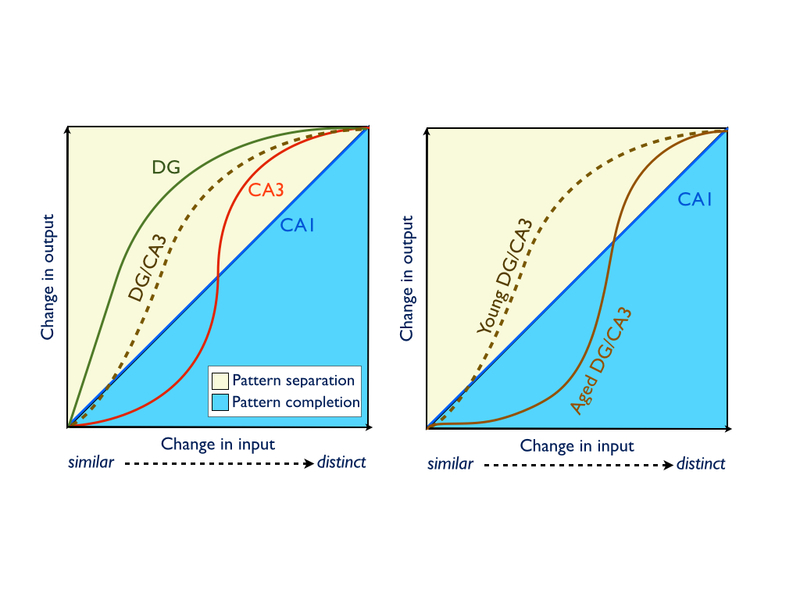 Due to reduced input from the entorhinal cortex via the perforant path, the dentate gyrus (DG) may not resolve and reduce the similarity of new input patterns (pattern separation), while the release of inhibition on auto-associative fibers of CA3 entrenches it in pattern completion processing. The result of which is an age-related memory impairment that emerges from failures to encode new inputs as independent from existing representations. Based on the hypotheses derived from the computational models and animal research in this area, we sought to expand these studies into the aged human. We developed a novel behavioral task to test the tenets of this neurobiologically-based model. In the Mnemonic Similarity Task (MST), participants encode color pictures of everyday objects and are later administered a surprise recognition test wherein they are shown repeated items, novel items, and critically, lures that are similar to previously viewed items, but not exactly the same. Their task is to determine if each item is old (a repeated item), new (a novel item), or similar (a lure item). Identifying these lure trials as “Old” (i.e., overgeneralization) is likely driven by pattern completion processes. In contrast, discriminating these lure trials from the similar study item requires a distinct representation of the objects – a hallmark of pattern separation. Utilizing this task, accurately identifying lures as similar items declines with age, consistent with an age-related impairment in pattern separation (Kirwan and Stark, 2007; Toner et al., 2009; Stark et al., 2010; Stark et al., 2013; Stark et al., 2015). Similar results have been reported utilizing variants of the task that emphasize spatial processing (Stark et al., 2010; Reagh et al., 2013). Importantly, consistent with rodent studies demonstrating variability in age-related memory impairments, a subset of aging participants performed within the range of the young adults, while another subset were markedly impaired. Furthermore, consistent with predictions from the Wilson model, larger changes in the input (greater dissimilarity) were required in order for older adults to encode new information as distinct from previously learned information (Yassa et al., 2010a; Stark et al., 2013). We developed an ultra-high resolution microstructural diffusion tensor-imaging (DTI) scan using MRI and demonstrated that the integrity of this pathway is reduced in older adults (Yassa et al., 2010b). Furthermore, the integrity of the perforant path in humans was tied to memory performance, such that reduced perforant path integrity in older adults was correlated with worse memory performance (Yassa et al., 2011; Bennett & Stark, 2015). In addition, we found reduced integrity in the fornix for older adults that was correlated with memory performance on a task that taxes pattern separation performance (Bennett et al., 2013), which may be selectively impaired in older adults (Stark et al., 2013). We have reported age-related changes in the CA3/DG during an object discrimination task (the MST) (Yassa et al., 2010a; Yassa et al., 2011). These data support the Wilson model that proposes that the failures to encode new memories in aged individuals arise from insufficient pattern separation in a hypoactive DG. The model also predicts hyperactivity in the CA3 as a result of reduced cholinergic input releasing the CA3 auto-associative fibers from inhibition. Using high-resolution MRI, we found an increase in CA3/DG activity during a variant of the MST (Yassa et al., 2010a). These data are consistent with the hypothesis that the aged CA3 demonstrates greater representational rigidity, requiring a greater change in the input before stimuli can be orthogonalized, resulting in decreased pattern separation (Yassa and Stark, 2011). In contrast to the age-related changes in CA3/DG, neuroimaging of the CA1 subfield of the hippocampus appears unaffected and is consistent with robust pattern completion performance (Yassa et al., 2010a). Yassa MA & Stark CEL (2011) Pattern separation in the hippocampus. Trends in Neuroscience, 34(10): 515-525. Yassa MA, Mattfeld, AT, Stark SM, & Stark CEL (2011) Age-related memory deficits linked to circuit-specific disruptions in the hippocampus. Proceedings of the National Academy of Sciences USA, 108(21), 8873-8878. Bennett, LJ, & Stark, CEL (2015) Mnemonic discrimination relates to perforant path integrity: An ultra-high resolution diffusion tensor imaging study. Neurobiology of Learning & Memory, S1074-7427(15)00120-3 do: 10.1016/j.nlm.2015.06.014.